Excited!! To know how to grow basil at your home? Yes, it can be possible with the greenery. Generally, when we make some exotic cuisine we need some exotic herbs and when we buy these herbs from market they are too costly. So now you can make your own exotic herbal garden at home to enjoy your delicious cuisines. Before starting we should know about the herbs. Herbs refer to the leafy green parts of a plant (either fresh or dried). Botanically, the word “herb” is also used as a synonym of “herbaceous plant”. Culinary herbs are distinguished from vegetables in that, like spices, they are used in small amounts and provide flavor rather than substance to food. Through this you can easily grow basil at home. Herbs can be perennials such as thyme, biennials such as parsley, or annuals like basil. Perennial herbs can be shrubs such as rosemary. Some plants are used as both herbs and spices, such as dill weed and dill seed or coriander leaves and seeds. Also, there are some herbs such as those in the mint family that are used for both culinary and medicinal purposes. In this blog we will discuss about the basil importance, its growth and maintenance. Basil (Ocimum basilicum) is a culinary herb of the family Lamiaceae (mints). It is also called the “King of Herbs” and the “royal herb”. It is generally used in cooking, making salsa, spaghetti sauce etc. Basil leaves can be dried as well and used in many different situations. Some people use dried basil leaves as a fragrance in rooms of their house. We also suggest the best 5 herbal plants for home. There are many varieties of Basil, as well as several related species or species hybrids also called basil. The type used in Italian food is typically called sweet basil (or Genovese basil), as opposed to Thali basil (O. basilicum var.thyrsiflora), Lemon basil (O. X citriodorum), holy basil (Ocimum tenuiflorum), which are used in Asia. Suitable conditions to grow basil at home. It needs Sunny location with rich, moist, slightly acidic soil that drains well. Plants seeds or seedlings in the garden 12-36″ apart after the last frost date for your area. Basil is highly adaptable and grows well almost anywhere, including raised beds and containers. 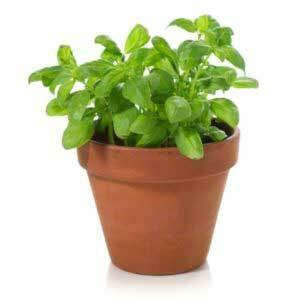 Basil can be grown from seed sowed directly into the garden soil, or transplanted as seedlings. 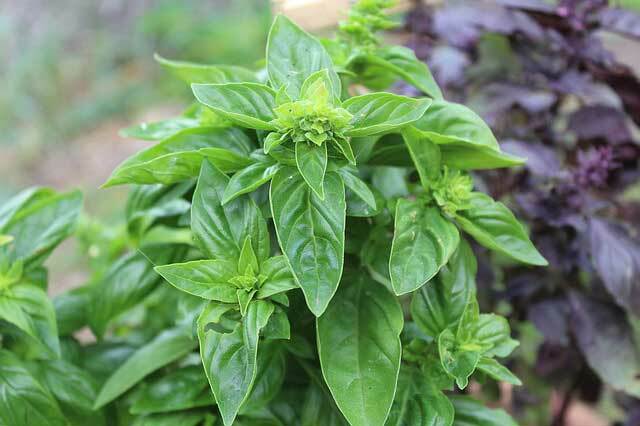 Basil is very tender, growth slows in cool weather and leaves may wither and discolor if nighttime temperatures are consistently below 45° F. Keep plants in cold frames in cool zones. Pinch out the tops of newly planted tall seedlings to about 6″ to promote root growth. Cut or pinch off flowers as they appear to encourage bushier growth. Keep the soil around plants consistently moist and weed free. Side-dress plants with well-rotted compost and use mulch to conserve soil moisture. There are many insects attracted to basil, but not ever recommend using any pesticides on an edible herb. Discourage pests by keeping the mulch from contacting the plant, and remove any unhealthy looking leaves. Spray off aphids or mites with a shot from the water hose. Basil is susceptible to fusarium wilt in hot, humid weather; look for cultivars that are bred for resistance and plant them in soil that drains well.Remove and destroy infected plants, including the roots and surrounding soil. Growing basil is very easy and requires very little maintenance. One or two good sized basil plants are usually enough for a small family. This entry was posted in Herbal Plants Blog, Latest Blog and tagged Bagbani, Basil, Garden care, gardening blogs, Gardening blogs bagbani, Herbal Plant, mybagbani. Basil is a good plant. its a religious plant of Indian.